Baltimore homeowners: your property tax rate will drop by a few pennies as your water/sewer bills climb by 9.5%. Beginning July 1, Baltimore government will give with one hand and take away with another. Property taxes for homeowners will dip by roughly 3 cents per $100 of assessed value, while water/sewer bills will rise by 9.5%. In broad stokes, this means that a family whose house remains assessed at $150,000 can expect to pay about $50 less in property taxes compared to FY18. But the same family can look forward about $125 more in water and sewer costs in FY19. This being Baltimore, nothing is as simple as it appears. Property taxes in particular. Under the “20 cents by 2020” program started by Mayor Stephanie Rawlings-Blake, a homeowner’s tax rate was supposed to drop to about $1.83 per $100 of value by FY19. Such reductions got interrupted and delayed by City Hall mini-crises and revenue shortfalls. Thus, the rate set for approval tomorrow by the Board of Estimates is a fraction of a penny under $2 per $100. Only property owners who qualify for the state’s Homestead Exemption will receive this special credit. For businesses and rented houses, the full $2.248 rate remains in effect. There are two other lurking caveats to the tax credit. It only covers improvements, not land. Land is assessed at the full tax rate, so the actual savings to homeowners is less than the advertised $1.998 rate. A much bigger factor for most homeowners is how much their property’s assessment rose in the last year. In Canton, Fells Point and Federal Hill, raised assessments are liable to wipe out – many times over – the homeowner credit for FY19. Every year, the Maryland Department of Assessments and Taxation revalues a third of Baltimore properties and phases in the new assessment over three years. Currently, downtown and harborfront neighborhoods are being reassessed, along with south and southwest Baltimore. All of which means that in places like Canton, Fells Point and Federal Hill, raised assessments are liable to wipe out – many times over – the homeowner credit for FY19. The cost of water and sewage will also take up a bigger slice of your household budget. Utility costs in Baltimore have been on an upward trajectory for more than a decade, needed to upgrade an old and rundown infrastructure that violates environmental laws. The 1972 Clean War Act, for example, bars municipalities from dumping raw sewage into waterways, but Baltimore routinely releases sewage during heavy rainfall into the Jones Falls that, in turn, migrates into the Inner Harbor. Some of the sewage is released through “structured outfalls.” Other human waste simply bursts out of manhole covers from an overwhelmed system. Since 2002, Baltimore has been under a federal consent decree to modernize its sewers and waste treatment plants. The city says it has spent more than $867 million on consent decree projects and plans to spend another $1.178 billion between now and 2030. Because utility operations are classified as “enterprise funds,” water and sewage rates are required to cover the bonds used to rebuild the system. The Department of Public Works (DPW) sets the rates with no outside review other than from than the Board of Estimates, a five-member body that includes DPW director Rudy Chow. 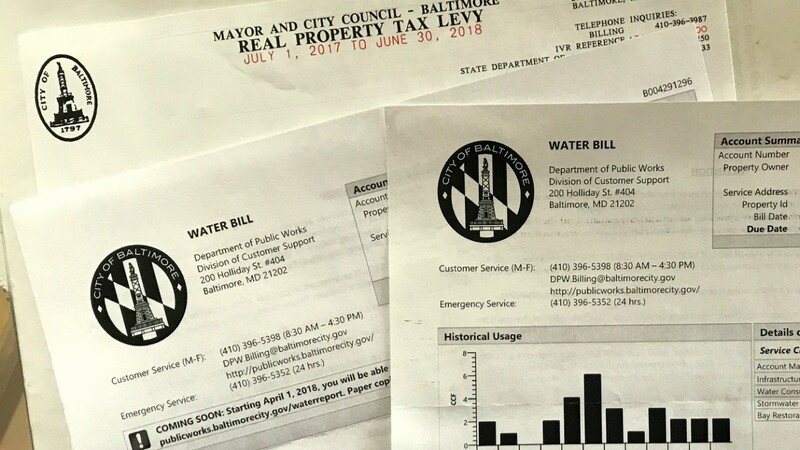 In the waning days of the Rawlings-Blake administration, the board approved a three-year, three-step increase that sent water and sewer rates soaring by 30%. Starting next month, the third step will go into effect. It will boost the cost of water coming into your home up by 9.9% and the cost of wastewater leaving it by 9.0%.